$247.00 Out of stock. Email me when new stock arrives. Danny Orleans of AmazeKids thinks Silly Billy has the best Santa Claus trick ever created for young children (aged 3 - 6 years). It's reminiscent of Run Rabbit Run, but with a chimney and Jolly Old St. Nick. Plus, the finale has so many possibilities. It is Santa Claus’ first day on the job. The elves tell him that in order to deliver the presents he has to go down people’s chimneys. But Santa is not a fan of chimney plummeting. (If you ask kids why they think he doesn’t like chimneys, you will get a lot of funny answers.) So, Santa has to practice going down chimneys so he is ready for Christmas Eve. You place Santa into the chimney but he keeps popping up out of the top (much to the kids' delight.) He doesn’t want to go in! When he finally does, he gets lost on the way down and pops out the left side... and then the right side of the chimney. 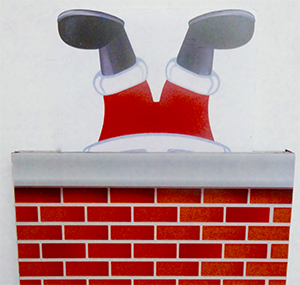 Finally he gets to the bottom of the chimney, but... he is upside down, as his cap dips down into the fireplace! When he takes the elevator to the top, his feet pop out first. He is upside down again! And of course you don't notice, but the kids sure do and they shriek with delight! It's all on the video clip at the top of this page. Watch it now. The chaos continues until you offer to help Santa. You open the chimney but Santa isn't there! When you turn around to find him, the kids see him first, hanging on your back! Want a different ending? The 8" tall Santa could be hanging from the family Christmas tree, just like an ornament! Or, even better, open the chimney to find Santa missing, then tell the kids, "Santa's at the front door!" What a great way to "make him appear" at your client's Christmas parties! The total of six Santas pop out of all kinds of places in this trick. They're made of super strong plastic with beautiful graphics. The chimney is 18” x 6” so it is visible in any sized room. At AmazeKids, we know this routine is seasonal, but Silly Billy's plot, in which Santa is practicing for Christmas Eve, justifies you doing this anytime after Halloween. Peek-a-Boo Santa is based on Silly Billy's hit trick Peek-a-Boo Bunny. He took everything he learned from building and performing it and added those improvements to the engineering of Peek-a-Boo Santa. You get the tricked out chimney, the six Santas, and a beautiful red velvet bag to carry it in! It looks just like Santa’s sack! And this red sack is a natural fit for the season. Buy Peek-a-Boo Santa today. It's super easy to learn, filled with opportunities to improvise and because you can make the final Santa appear anywhere in the room, you can really customize it for your client. This is the perfect trick for magicians in need of a new holiday-oriented routine. And we promise, after every show, you'll have trouble deciding who had more fun -- you or the children. This is a must have item for Christmas shows. Brilliant idea and superb routine. Order it now before they run out. This is not a review, but an idea: near the end of the routine, when you show the inside of the chimney, rub a couple of your fingers on some charcoal or something that will color them black, for an added effect to "prove" it is a real chimney inside.